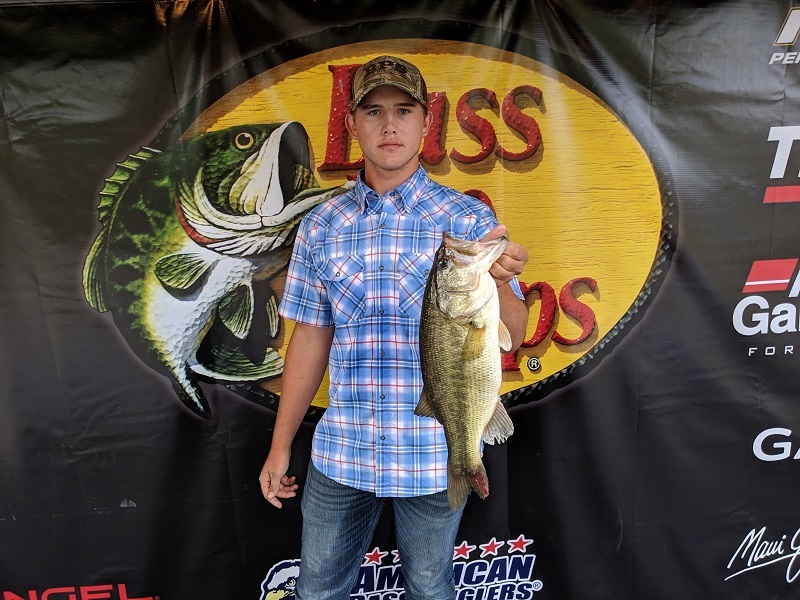 ATHENS, Ala. – Toby Morrison of Lyerly, GA won the Bass Pro Shops Open Series Alabama North tournament, held April 13th on Neely Henry. Running out of Coosa Landing in Gadsden, AL Morrison caught five bass weighing 20.13-pounds. Morrison also caught a beautiful 6.52-pound bass that took Big Bass for the boaters. For the Boater Division victory, Morrison took home a check for $5000 as well as a check for $630 for his big bass. “I caught my fish on a horny toad and flipping a jig. I caught them about 4 or 5 miles upriver. I caught them all shallow. My lower unit went out on the way out this morning and I trolled the rest of the way there about another mile out. I trolled all the way back. I stayed in my area longer than I normally would have today because my lower unit was out, but it caused me to catch better fish.” Morrison said. In second for the boaters, Gary Howington of Gadsden, AL landed a five-bass tournament limit going 19.89-pounds. He collected $1000 for his catch. “I caught my fish in about 15 feet of water sitting on about 30 feet of water. I used a crankbait and fished upriver.” Howington said. William Johnson of Glencoe, AL took third for the boaters with five bass going 18.02-pounds. “I used a crankbait and caught them shallow. I also fished upriver.” Johnson said. Finishing fourth, Dustin Seaborn of Guin, AL landed a five-bass limit for 17.11-pounds. Bradley Jones of Aragon, GA rounded out the top five boaters with five bass at 17.06-pounds. In the Co-Angler Division, Garrett Brown of Trion, GA won with three bass going 9.55-pounds. Brown earned $1500 for his win. “I caught my fish in about 10 to 20 foot of water. I was fishing upriver all day. I caught them on a dropshot, a shakey-head, and a spinnerbait.” Brown said. Taking second for the co-anglers, Michael Jones of Rome, GA brought in a three-bass division limit weighing 8.02-pounds. Jones Boater was sick and he had to weigh in at 12:30p.m. a full 3 hours before his weigh in time! “I fished super shallow and stayed around grass and woods. I fished down river in and out of cuts. I only used a Joey Jordan custom swim jig to catch my fish today.” Jones said. Matt Cameron of Southside, AL placed third among the co-anglers with three bass going 7.76-pounds. “I fished right on the bank and fished shallow like that all day. I fished in the first little area near the power plant but not sure what it’s called. I fished with a shakey head worm.” Cameron said. In fourth place among the co-anglers, Vernon Miller of Manchester, GA brought in three bass for 7.23-pounds. Duanne McQueen of Hampton, GA finished in fifth place with three bass for 7.19-pounds. 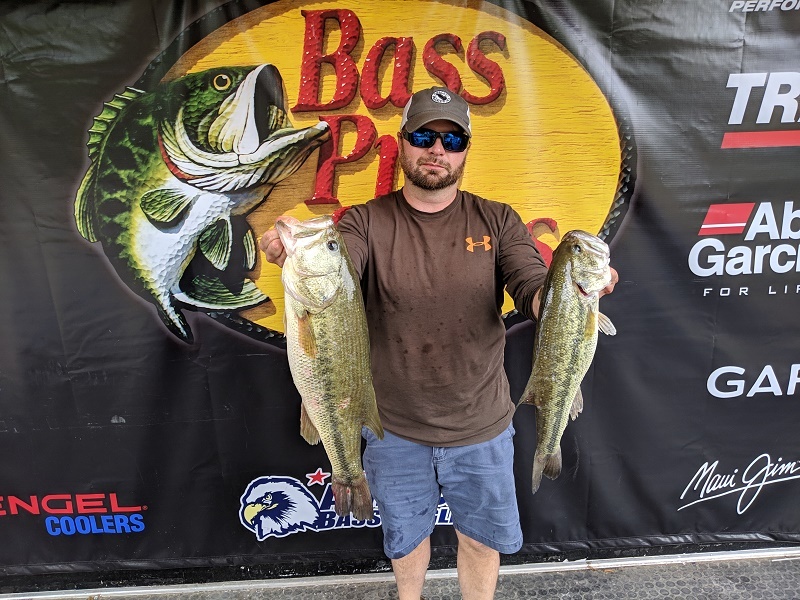 Coming in seventh for co-anglers was Mark Pirkle of Cleveland, TN who caught 2 bass and the big bass for the co-anglers. He pocketed a check for $250 for his 4.60-pound big bass. Slated for May 4th, the next tournament will be held on Lake Guntersville out of Goosepond Bait and Tackle in Scottsboro, AL. At the end of the season, the best anglers from across the nation advance the 2020 Ray Scott Championship to be held at Lake Hartwell in April, 2020.